I’ll be honest: While I really enjoyed Daredevil #29, one thing I missed this issue was some follow-up to what we learned about Matt’s childhood last issue. 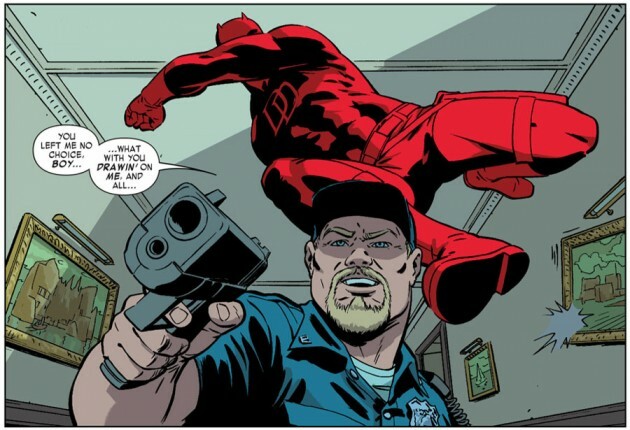 I know that writer Mark Waid and the rest of the team will have plenty of time to revisit some of the things brought to the surface in Daredevil #28, but I came into this issue expecting something a little different than the issue we got. This isn’t necessarily a bad thing, as the direction we do get is sure to get anyone’s pulse racing and is really quite well executed. This issue devotes itself fully to being a non-stop action meets a classic whodunnit mystery adventure, and in that vein, it is nothing short of brilliant. Or should I say “who-else-dunnit”? After all, we all know who pulled the trigger and on whose orders, but what we don’t know is how many of the people on the scene are in on the conspiracy. Neither does Daredevil, who is confused by everyone showing the reactions of stress he would normally use to single someone out. In fact, he is even more confused than the reader as the otherwise admirable quality of not being able to judge anyone by the color of their skin works against him. While the underlying premise of this story is quite sinister – we have a man at risk of bleeding out on the floor following a white supremacist power play – Daredevil #29 is also quite funny. Matt uses his best acting skills to play up the defenseless blind lawyer angle to get himself out of the room, and then goes on to encounter one absurdity after another, albeit very chilling in their implications. Aside from Matt’s funny side, his strong intellect is also prominently on display this issue. I’ve said before that I really enjoy seeing Matt use his brain to get out of messy situations, and that is exactly what he does here. Acrobatics and heightened senses wouldn’t get anyone very far if they didn’t have the brain power to put them to good use. Here, Daredevil makes all the right moves and takes the reader on a breathless romp through the court house where he is chasing down a jamming device while trying to keep himself and innocent people alive. The sequence of events is supremely well laid out and the pacing is perfect. Penciler (and colorist!) Javier Rodríguez, with Álvaro López on inks, is a perfect match for Waid’s wild adrenaline-steeped script. The artwork is expressive and dynamic, and uses interesting angles and perspectives to great effect (note, for instance, the snipers cornering Daredevil and his fellow escapee in the stairway and their subsequent plunge to the bottom). I get the sense that Rodríguez may have had a little less time to work on this issue compared to the last one, but the end product doesn’t suffer for it, especially given the big emphasis on quick movement and action this time around. The attention is right where it needs to be, and you can literally feel the tension on the page. One final comment on the larger implications of this story. I think I probably wasn’t the only one who thought this story would be a stand-alone two-parter which wouldn’t contribute much to the bigger story beyond keeping Daredevil fans thoroughly entertained. What we get though, is some serious sowing of seeds for subsequent stories (alliteration is my super-power). Matt is left to deal with not just the physical cancer that threatens his best friend, but the metaphorical one which has infested “his” justice system. And we don’t know yet whether either of them has metastasized. Waid may decide to let this one brew in the background for a while, but it’s nice to know that there is always a bigger plan behind everything that happens in this book. There has been a lot of chatter on the blogosphere, about Daredevil being a TV series. So far I haven’t agreed with this, primarily becasue the story arcs are too long. Then along comes this issue\episode to completely convince me. Courtroom drama! Unexpected Twists! Explosions! Cliff-hanging Ending! Although I really don’t know what to make of the Solicits for #30…. Very good read. I re-read issue 28 before picking this up and I actually think 29 was the vastly superior issue. I liked this issue more, frankly because it didn’t follow up on the flashbacks from Matt’s past. They were the weakest part of issue 28 to me. I commented on this on the review of that issue, so I won’t repeat myself. Also on repeat reading Nate’s character came across as much more of a cliche. Matt has a line “I’m surprised to realize I’m still furious and resentful all these years later.” Its not surprising at all considering Waid made this guy into the most obnoxious and annoying cliche possible. I was honestly rooting for Matt to tell the guy to go to hell and deal with his crappy life himself. If Nate had been portrayed as a nice guy who was genuinely sorry for past actions, it would make Matt’s resentful nature interesting. I’m rambling, I guess my point is issue 29 was so much better because Nate spends 90% of the issue unconscious. I still think issue 28 was pretty solid. Waid’s worst issue is still better than 90% of whats being published in the comic industry. Agreed on almost all of your points on this issue. The art was great. The panel you posted of Matt about to drop that guard was my favorite of the issue. 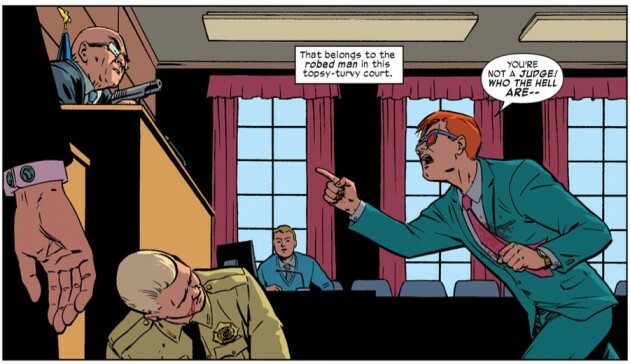 Waid really knows how to show DD as an intelligent guy. As for the cliffhanger, I’m gonna guess She Hulk. Not for any particular reason other than I don’t think they’ve ever had a story together, at least in the modern age (not counting House of M), which is funny since they are Marvel’s top 2 lawyer characters. My guess is Becky Blake or Rosalind Sharpe. Foggy’s estranged mother could be an interesting choice. I like the Becky Blake idea. the obvious answer is McDuffie (“I think I’m in love with this woman.”) but would she quit an ADA job to be a trial lawyer? also, any scientific thoughts on why that gun seems to be appearing out of nothing in Radar-vision? wouldn’t DD see the rest of the arm, the body and possibly the background? perhaps it’s just showing motion…the gun being pulled quickly. “Ouch. What am I, blind?” cracked me up. I strongly feel like the character who shows up at the end is Becky.